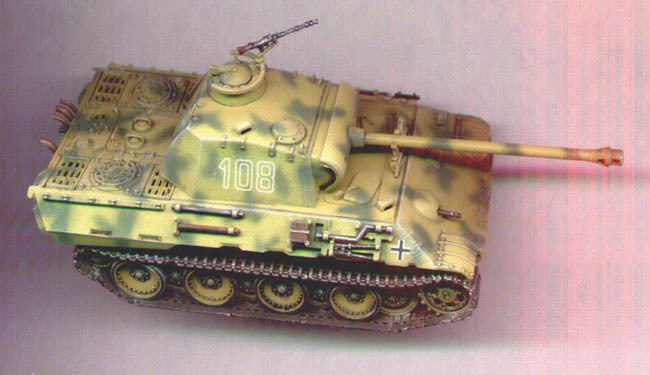 For a long time, this was the only kit available of the Panzer V Ausf. A Panther. But then Revell AG issued a kit in 1997 of the Panther D/A, which can build into either version. Both kits have strong points, as well as a couple of weaknesses. ESCI's kit is very well molded, and has abundant detail. The dimensions scale out a little large against plans in the Achtung Panzer volume on the Panther family of tanks. The hull is about 1/70th in width, and 1/71st in length, which is not too bad. But the turret face (and gun mantle) is way too wide. The Revell kit's dimensions are more accurate. The turret and hull have a surface texture reminiscent of cast metal, i.e. not completely smooth and polished. While this looks very good on the completed model, it doesn't help much with smooth decal placement. I like how ESCI molded each pioneer tool separately. If you've read many of my reviews, you'll recall that this is a personal preference of mine. There are tool racks that attach to the hull, and the tools attach to the racks. Some of the tools are formed a little heavy, so they stick out from the hull some, but some delicate sanding and smoothing will help this considerably. My main complaint about this kit are the open sponsons above the tracks and wheels. Pick up the model, and you can look right up into the vehicle. Also, one can look down through the engine deck grates and see out the sides of the vehicle. The builder would do well to blank off these areas. As I mentioned, the deck grates are molded open, through the hull. Other detail on the hull is very well done, as is the gun barrel lock on the forward hull. The only option for the exhaust pipes is the single pipe on the right, and the triple pipes on the left. All hatches can be open or closed, including the driver's and radio operator's hatches on the hull, and the commander's and rear ammo loading hatch on the turret. A fairly decent AA machinegun is included on the sliding ring mount around the commander's hatch, and the hull machinegun consists of the entire gun that sticks through the hull, not just a barrel that glues into a hole. Another drawback of this kit, and one area in which the Revell kit totally surpasses this one, are the tracks. The wheels are very good, but the tracks are very short of detail. Even the hard plastic tracks, which I used on my kit, are poor. The exteriors are mediocre, but the inside surface is completely smooth; not even lines demarcating the individual links. I had thoughts of duplicating the nice Revell tracks for use on my ESCI Panthers, but the Revell kit has an incorrect number of teeth on the sprocket wheel (unlike the ESCI kit), so the guide holes in the track are not the proper distance apart, and consequently, the links are too large. The spare track links included in this kit for the rear hull are fairly poor as well. The only alteration I made to my kit was replacing the hatch handles with brass wire. (I noticed after taking new photos of this kit, about two years after I first posted this review, that I had inadvertantly switched the two hull hatches - ouch!). It was painted with Polly Scale Panzer Yellow and Panzer Olive Green. The kit decals, as always, were printed out of register, so I replaced them with some Microscale decals. After using some setting solution, and finishing off with clear flat, the kit was complete. I really cannot say which kit I prefer, the ESCI or Revell, as either one will build into a very fine replica of the Panther A.